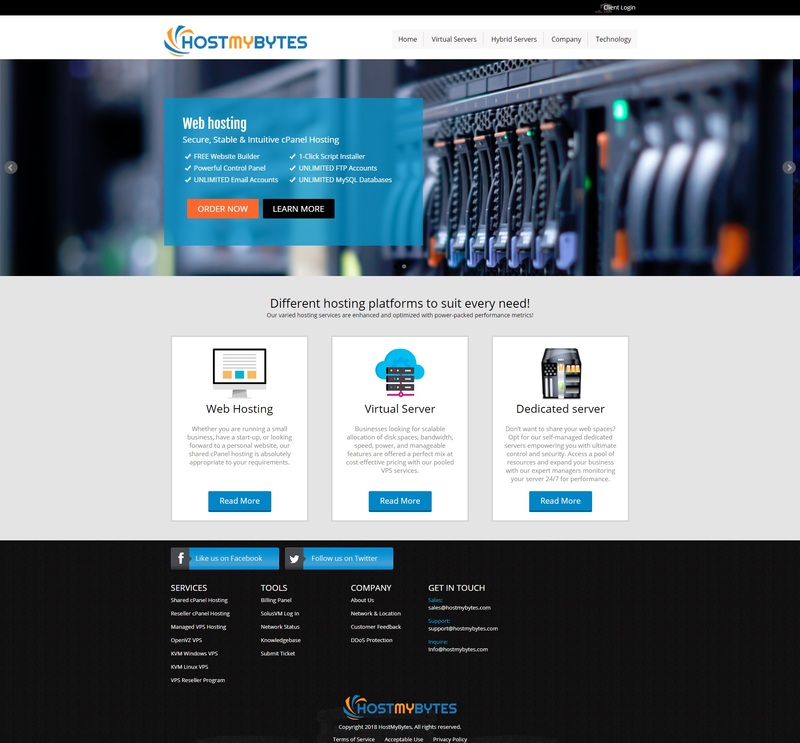 Jonathan, from HostMyBytes, contacted us with some attractive pooled VPS offers in Los Angeles for the LowEndBox community. This offer uses pooled resources for VPS instances. You can buy one plan and then divide it into multiple VPS instances at your desired specifications. And to make this happen, they are also bundling in a generous amount of IPv4! Additionally, their Los Angeles location supports IPv6, just in case that feature is important to you. Please let us know your feedback and if you have any questions/comments! Look at all the negative reviews. Just enrolled in today. The client area seems to be running slow. But I was spin a vpn out of my 3. speeds looks all right. If there is any tool that you want me to run, I can run and test it. Looks good to me. Hopefully it stays the same! I have already been a client with this host, it was a good server in Montreal (but no longer offered). During the last Boxing Day, he put a promotion for VPS Pool, I tried to buy one as my contract expired with them. I completed my payment quickly with Paypal, I provided the details in a support ticket, but I never had my product active. I opened several tickets because neither the billing department nor the technical support was able to complete the transaction and I always had to raise them to have the least answer, sometimes never arrived. I have been refund twice (for two attempts) by Paypal because I opened a dispute and the host has never responded. I strongly advise, I do not trust anymore. It’s cheap VPS, i’m thinking about to add crypto payment! Just ordered the 5x VPS Pool Special but not UK available ? Is it going to be available soon sir ? why don’t you just give a ipv6/64 block? Unfortunately, we do not offer a refund. Be careful this service does not work and no refund. Does the 3-day refund policy applies to these offerings? Hard to tell from your Terms of Service. Is this some kind of April joke? Connecting to repos.lax-noc.com (repos.lax-noc.com)|198.55.111.5|:80… connected. I’d recommend against HostMyBytes. Their support is responsive but in all honesty not very helpful. ssh in times are ofter 60seconds just to get to the bash prompt. Serving text only WP pages (my images are on cloudfront/s3) time out. Simply you are not getting 3 CPU cores nor 3GB of ram. Given I have struggled to get 0.3% CPU allocation you can image how oversubscibed they are. In short you would be better off plugging a raspberry pi into a 56k modem. I would recommend avoiding HostMyBytes. I signed up but their performance is so bad it is completly unusable. Be prepared for 60sec+ ssh login times, web page timouts and unhelpful (though responsive) support. The servers are clearly massively oversubscribed with some seriously high load customers. You would be better off with a raspberry pi and 56k modem. you should improve your customer support first and give a proper response to your existing customers. Pre-Sales Support is very VERY BAD. Luckily i+we did not buy any VPS-POOL PLAN yet, we asked questions 1st, before we’re sorry or get cheated or loose or have headache. We even created an account to get better support, but it is same or worst. Their sales-support informed, after our inquiry, after days/week of waiting : rDNS/Reverse-DNS/PTR record cannot be set for IP-Address in VPS-Pool !!! Then how can an account-holder run MAIL-SERVER in VPS-POOL servers ? without the rDNS/PTR set correctly, any sent eMails will be rejected and/or identified as SPAM, and then VPS-POOL SERVER’s IP-address will be submitted into SPAM/BAN-LIST ! AND NO-GUARANTEE ON ANY-TYPE OF PLAN’S BANDWIDTH/BW, AND, NO DETAIL INFO ON BW (Upload speed) SHARED IN-BETWEEN HOW MANY VPS/KVM SERVERS, AND NO INFO ON WHAT IS HMB’s MAX UPLOAD BW/SPEED TO THEIR ISP, AND NO INFO ON IF THEY HAVE ANY REDUNDANT ISP OR NOT. See other COMMENTs made under their previous/OTHER few deals. BE-VERY-CAREFUL WITH THESE VPS-POOL PLANS FROM THIS SERVICE-PROVIDER. We’re still waiting for their response for our support-ticket. Pre-Sales Support is very VERY BAD ! Luckily we did not buy any VPS-POOL PLAN yet, we asked QUESTIONS 1ST, before we’re sorry or get-cheated or have-headache. We even created an account to get better support, but it is same or worst ! They auto-close support-ticket after 24 or 48 hours, without even any response/answer !! Their sales-support has informed us, after our inquiry, and after our multiple requests, after days/week of waiting, that, rDNS/Reverse-DNS/PTR record cannot be set for IP-Address in VPS-Pool !!! if you do NOT allow rDNS or MAIL-SERVER, THEN JUST SAY IT IN YOUR ADVERTISING, OR ARE YOU DOING THIS RESTRICTION TO ONLY-SOME ?! AND HMB HAS NO-GUARANTEE ON ANY-TYPE OF PLAN’S BANDWIDTH/BW/Speed ! NO DETAIL INFO ON BW (Upload speed) SHARED IN-BETWEEN HOW MANY OTHER VPS/KVM SERVERS ! NO INFO ON WHAT IS HMB’s MAX UPLOAD BW/SPEED WITH THEIR ISP ! NO INFO ON IF THEY HAVE ANY REDUNDANT-ISP OR NOT. See other COMMENTs made under their previous/OTHER few LEB offers/deals. We’re still waiting & waiting days after days for their response for our support-ticket. Most SLOWEST SUPPORT SERVICE i’ve+we’ve seen from any VPS/Hosting Service Provider. Never got a response so I’ll ask again. Does the 3-day refund policy apply to these LEB offerings?? All VPSs are crapped out also. Go figure. To Everyone, HostMyBytes Pre-Sales Support is very VERY BAD ! We checked their guide-articles, and then even created an account to get better support, but it is almost-none or worst ! in that case, how can an HMB-account-holder run MAIL-SERVER(s) inside a VPS-POOL server ? without the rDNS/PTR set correctly, any sent eMAILs will be rejected very-likely and/or identified as SPAM, and then VPS-POOL SERVER’s IP-address will be submitted/entered into various SPAM/BAN-LIST ! HMB, if you do NOT allow rDNS or MAIL-SERVER, THEN JUST SAY/CLARIFY IT IN YOUR VPS-POOL ADVERTISING, OR ARE YOU DOING THIS RESTRICTION TO ONLY-SOME ACCOUNT OR BASED ON YOUR OWN CHOICE ?! AND HMB HAS NO-GUARANTEE ON ANY-TYPE OF PLAN’S BANDWIDTH/BW/Speed ! NO DETAIL INFO ON BW (Upload speed) SHARED IN-BETWEEN HOW MANY OTHER VPS/KVM SERVERS ! NO INFO ON WHAT IS HMB’s MAX UPLOAD BW/SPEED WITH THEIR ISP ! NO INFO ON IF THEY HAVE ANY REDUNDANT/FAIL-SAFE ISP OR NOT. See other people’s COMMENTs made for their PREVIOUS/OTHER few LEB OFFERS/deals. Users are complaining that upload/download is almost close to ZERO into/from their paid VPS/Servers ! BE-VERY-CAREFUL WITH THESE VPS-POOL PLANS (WITH INADEQUATE DETAILS) FROM THIS SERVICE-PROVIDER. We’re still waiting & waiting days after days for their response for our support-ticket, and in the mean time they increased the $15/yr plan price into $19/yr ! Most SLOWEST+…SUPPORT SERVICE i’ve+we’ve seen from any VPS/Hosting Service Provider. Ordered a 5 core VPS, nothing works and they are not answering tickets all day. Unfortunately I have to jump in the bandwagon and strongly recommend against using hostmybytes. Their support is not helpful and they actually delete the whole support thread when you start pointing out that they haven’t answered your questions. I purchased two VPS from them last year for $90 total that I just gave up on since they wouldn’t help and deleted the ticket. I mean, they didn’t just close the ticket, they actually deleted it, as if it never existed. Stay away!!! It was pretty impossible to set up working servers in chosen locations but to their credit, they did send a refund when I requested it within 24 hours. Their facility for setting up servers is great but unfortunately it does not seem to ensure that they will actually work. GARBAGE PROVIDER, DON’T USE THEM. I got a VPS from them last year (4gb for $30/yr) and it is very clear that in this instance, if it’s too good to be true, it probably is. Their server has been nothing but slow and just plain terrible. The disc IO seems to be very oversubscribed to the point where things just hang. They even moved my VPS to another “node” which did almost nothing to improve the situation. My DigitalOcean 1gb droplet is faster than this. It seems really good, but ultimately their service is crap and their support is unfriendly. Be careful, their service is terrible. And they do not offer any refunds under any circumstance, even when they failed to provide the useable service you’ve paid for. I have had 7 VPSes on HostMyBytes and once was satisfied with them one year ago, but now I’m moving all of my VPSes out of them and will never use their service again. They are obviously overselling and their VPS disk performance is ultimately terrible. It often took forever to finish an apt upgrade command, and when I asked support regarding the problem, they just repeated the same sentences “We continuously monitor the load average to maintain the load on the host node to avoid such issues, your server will be online shortly.” and by “shortly” they meant over a week. People need to start doing CC charge-backs on this company. My nodes have been up at most 3 days (2 times in 3 weeks), and usually crap out every other day.